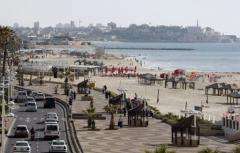 A picture shows Tel Aviv's sea front promenade on the Israeli Mediterranean coastline in March 2009. The Mediterranean Sea was mostly filled in less than two years in a dramatic flood around 5.33 million years ago in which water poured in from the Atlantic, according to a study published Wednesday. The Mediterranean Sea was mostly filled in less than two years in a dramatic flood around 5.33 million years ago in which water poured in from the Atlantic, according to a study published Wednesday. Sea water flooded in through the Strait of Gibraltar at a rate three times the current flow of the Amazon River, said the report publish by the scientific journal Nature. About 5.6 million years ago the Mediterranean Sea had became disconnected from the world's oceans and mostly dried up by evaporation with its largely saline surface between 1,500 and 2,700 metres below sea level, the study said. "The Atlantic waters found a way through the present Gibraltar Strait and rapidly refilled the Mediterranean 5.33 million years ago in an event known as the Zanclean flood," it said. "Although the flood started at low water discharges that may have lasted for up to several thousand years, our results suggest that 90 percent of the water was transferred in a short period ranging from a few months to two years." Previous studies have suggested that it could have taken between 10 and several thousands of years to fill the Mediterranean, according to the depth of the Gilbraltar strait. Scientists led by Daniel Garcia-Castellanos from Barcelona's Institute of Earth Sciences Jaume Almera used borehole and seismic data to reveal a 200-kilometre-long (125-mile) channel across the Gibraltar strait that was carved out by the floodwaters, Nature said. They used an incision model to estimate the duration of the flood and reach their conclusions. "We do not envisage a waterfall, as is often represented: instead the geophysical data suggests a huge ramp, several kilometres wide, descending from the Atlantic to the dry Mediterranean...," the scientists said. "This extremely abrupt flood may have involved peak rates of sea level rise in the Mediterranean of more than 10 metres a day," they said. Garcia-Castellanos told AFP that even though the water flowed into the Mediterranean Sea at huge speeds it was at a relatively small angle of between one and four percent. The incision channel started tens of kilometres inside the Atlantic and seemed to slope gradually towards the centre of the Alboran Sea, in the western Mediterranean. "We also know that the velocity of the water flow must have been more than 300 kilometres an hour," he said. The abruptness of the flood, which may have been triggered mainly by tectonic subsidence, appeared to have been "catastrophic" because of its effect on the Mediterranean ecosystem and the climate, the paper said. Studies of sediments had shown a marked changed between the period of salinity, when there was little marine animal life, and the one immediately afterwards which was characterised by a great number of species, it said. It must have been quite a sight... some of our ancestors may have witnessed it... 5.33 million years puts the event in the time of Ardipithecus. It would have been extremely cool to watch.